Fred Hurlbut started Professional Water Systems, Inc. in 1980 and was later joined by brothers Paul, Randy and Tom. Fred’s father-in-law was a well driller who did not want the headaches of dealing with water quality. Fred, being an entrepreneur, moved up from Georgia to Connecticut to learn the business. 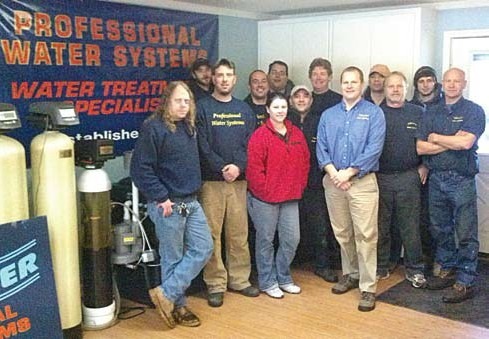 Being very personable and standing behind the work that he did, he realized that besides the local Culligan guy, there was not another outfit that specialized in water treatment. There was a lack of service providers in the area and Fred saw a huge opportunity to fill this gap. Paul—who started out doing service and installation then went on to sales—is the current Vice President, part owner and company spokesman. His nephews Andrew (GM) and Chris (Customer Service Manager) keep things running smoothly on a day-to-day basis. Fred is now semi-retired but still reviews the business operations and financials on a weekly basis. In addition, Ron Marquis (the best man at Fred’s wedding), who left an accounting firm to help Fred handle the bookkeeping, is still with the company. The most common problems Professional Water Systems deals with are hardness, iron, manganese, acidity and radon in water. But it also encounters bacteria, sulfur odor, arsenic and uranium issues as well. “We have always prided ourselves on designing systems based on the water quality and the concerns of the customer,” noted Hurlbut. “We have never been a proponent of a one-size-fits-all approach, combination units or some of the gimmicks that are out there. Water softeners are still one of the most common applications given the water quality issues we have. We also install a significant amount of aeration units to reduce radon in water. Drinking water applications such as RO are steadily becoming common, too.” About 95 percent of the business is residential water treatment of private wells. In addition, the company has several condominium complexes, schools and small commercial buildings in which it has installed and provides maintenance for their water systems. The business keeps its focus on giving every customer the best it has to offer. The results of their continued efforts speak clearly, for the company and the customers. “The most rewarding part of the business is getting referrals,” Hurlbut said. “The fact that you have made a customer so happy that they have given your name to another potential client is the greatest reward you can ask for. Overall, the best experience of this business is the ability to give someone clean, safe drinking water as well as a water quality that isn’t going to ruin the plumbing infrastructure of the home. In addition we have been fortunate enough to have had a majority of our employees for a long time. Therefore we have created a family-like environment and an attitude that ‘we are all in this together’, which is also rewarding as a business owner. There are a few challenges that we face on a day-to-day basis. There are still a lot of outfits trying to sell people equipment they don’t need or won’t solve their problems, which makes it confusing to the customer and more difficult to convey what the right way is to solve their water quality issues. In addition, the dynamic of homeowners going on the Internet and suddenly becoming experts on application and price, it’s even more difficult to explain the value of a full-service water treatment company. “I think our business plan will be pretty much the same over the next five to 10 years,” he said. “We have and will continue to focus on growing at a sustainable rate without compromising on the quality of the service we offer. Even during the last five difficult years, our gross numbers have increased five to 10 percent annually. We are looking to expand our service territory and with the new business in Florida, we hopefully will continue to be blessed with good fortune.”” Good statistics, good will and lots of positive outlook make this company a long-term player in the water industry.